Fun, passion and incredible learning opportunities prevailed at the 17th annual Transitions Academy event at the Rosen Shingle Creek in Orlando, FLA this past January. Who had fun? I dare say everyone who attended the Darius Rucker concert. The former frontman for Hootie and the Blowfish performed his new-style country music at the closing event. Why Rucker? Because he is a celebrity ambassador for Transitions® lenses! I imagine that all lovers of good cuisine had fun meeting Food Network® celebrity chef and long-time Transitions lens wearer, Robert Irvine, at the Transitions Academy.Irvine, host of Restaurant Impossible, is another 2013 celebrity ambassador for Transitions lenses. Chef Irvine made a special guest appearance during the North American marketing session, and joined Sherianne James, director, North America marketing, on stage. Additional celebrity ambassadors for Transitions lenses in the coming year will include baseball legend Cal Ripken, Jr. and National Geographic reporters Annie Griffiths and Andrew Evans. All ambassadors were chosen after Transitions Optical conducted research into consumers’ interests and identified four top passions – music, sports, travel and food – giving them direction for 2013. The passion at Transitions Academy came through, not only in the enthusiasm these ambassadors have for Transitions lenses and healthy sight, but also in the incredible learning opportunities created in a series of FranklinCovey workshops. The “Working at the Speed of Trust” session provided tips for identifying and addressing “trust gaps” within a business and creating a more positive working environment. The “Five Choices to Extraordinary Productivity” session inspired employees to make more selective choices about where to invest their time, attention and energy. A third workshop, “Seven Habits of Highly Effective People,” provided attendees with tools to help maximize performance and reach career goals, both individually and as a team. 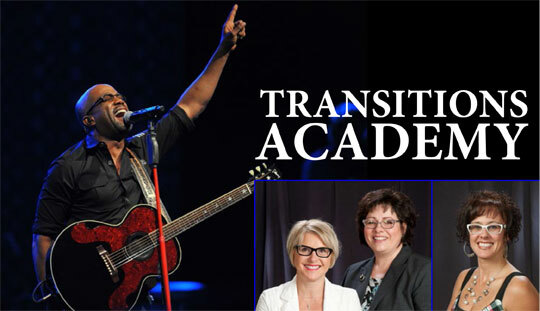 And amaze her they did, for Transitions Optical selected Hill-Campbell as the winner of the 2012 Transitions Canadian Eyecare Professional of the Year award. Hill-Campbell was recognized for her outstanding efforts to promote eye health and the benefits of Transitions lenses in front of more than 1,100 optical professionals from North andSouth America. Lunetterie New Look was also honoured as the first-ever Transitions Retailer of the Year inCanada. France Reimnitz, vice president of marketing and merchandising, accepted the award on behalf of the New Look team. “We have a long history of doing everything we can to provide the best possible experience for our patients, and a big part of that has meant offering the entire family of Transitions lens products,” said Reimnitz. And so another fun-filled and passionate Transitions Academy has left indelible memories and inspired action in the hearts and minds of all attendees. This invitation-only event takes place annually. How do you get an invitation? Talk to your Transitions representative!